This is my favourite residential island in the southern Gulf Islands, because the residents have managed to keep the island very rural, quiet, and clean. The "roads" are just dirt tracks, the properties are tidy and set apart, and the landscape is just gorgeous! Even though the island is subdivided into privately owned lots, there are a lot of public accesses to beautiful rocky beaches and bays. 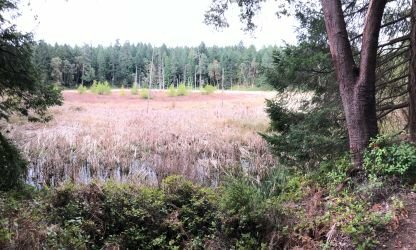 There is also a park in the middle of Ruxton Island (image shown here) that consists of a large, open wetland with a funky trail meandering along its north side. There are community wells (non-potable) with pumps throughout the island. Bylaws have prevented the large-scale construction of docks around the island, which means that most residents must anchor in one of the sheltered spots around the island and use a dinghy or other small craft to get to shore. The population is small enough that nobody seems to mind if your little boat remains pulled up on the beach above the tideline while you're on the island. Ruxton is directly across the water (5km) from Cedar and Yellow Point, just south of Nanaimo. It's part of a chain of islands which also includes Mudge and Decourcy Islands (Ruxton is the smallest of these). I can help with your Ruxton Island sale or purchase! Contact me and I'll make it all happen.